Thank you all for your help and support over the last year. 2017 was a great year of training, and we’re looking forward to even more great training with you all in the coming year! The past year has seen the number of articles on the Aikido Sangenkai blog pass the 150 mark, with more articles translated into more than fifteen languages. For the coming year, our Sangenkai workshop for February 2018 has registered attendees from Japan, Korea, the mainland USA, Sweden and our local and neighbor island Sangenkai members as well as a large group of New Zealand and Australia Sangenkai members coming for a special intensive workshop in addition to the regular workshop, making the Aikido Sangenkai the only Aikido group in Hawaii to hold regular workshops with an international attendance. 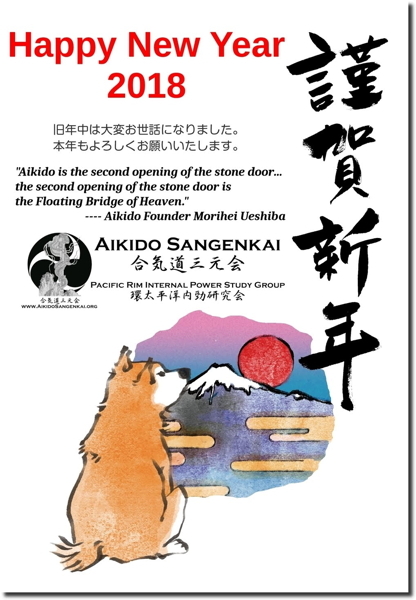 As you can see on our New Year’s card above, Morihei Ueshiba often described Aikido as the “second opening of the stone door”. But what about the first opening, and why was it related to Aikido? For the answers to that one – check out this post about last year’s New Year’s card. On this year’s nengajo we have the first sun of the year (初日の出) rising over Mt. Fuji. 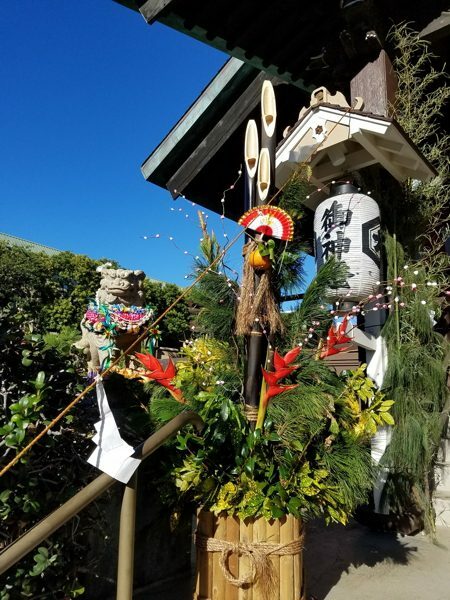 The tradition of viewing the first rising sun of the year is also linked to the story of the stone door and the reappearance of Ama-terasu Omikami in the world. There are many paths to the peak of Mt. Fuji, but they all end at a single destination. That is, the path to love. Everyone has different methods of training, but they all arrive at the same destination. The martial arts of Japan are in no way the paths towards war, struggle or conflict. They are the paths which all people can take with joy as brothers and sisters. Happy New Year Mika – see you soon!